Matt Baker and Michelle Ackerley are joined by composer Lord Andrew Lloyd Webber, who explains why he has put songwriting on hold to finally pen his memoir. 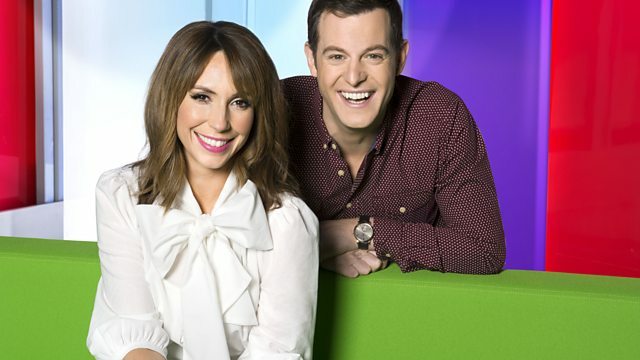 The One Show with Matt Baker. of All Challenges for Sport Relief. to a showstopping finale on Friday. who could write them one. Your fans are in tonight. Hawking. You must have met him? classical music, the Mozart requiem. been a glorious time to be alive. tragic if it weren't funny. well. I have known him for 20 years. time I met him. He was my Oied idol. was basically a really nice bloke. That was the thing that came across. could not fail to be inspired. that crossed generations, didn't it? be Stephen's voice. Look at this. on a potential plastic tax. have all been calling for. almost like a panic at the moment. that some say it is. million of these glasses a day. Designed to be used one time only. the product is difficult to recycle. make it back into a cup. with say it's the end of the line. wroo writing a I used to memoir. enjoyed doing. I can't write lyrics. doing a musical of your life? wonder what the neighbours thought. into town when I was nine years old. musicals. I fell in love with them. thought of rock music as theatre. Drury Lane, and that is one of ours! be great fun, make it for today. and it is quite a read, I must say. chosen to cycle the first leg. lucky heart from my girl. little girls, I was too scared. was the Trigger for that? have got to get some help here. You can do it, Debs. can. Keep driving, great work. up. Even after miles of cycling. bravest riding I have ever seen. That is inspirational for anybody. Amal take on the next leg. I just wasn't motivated to move. casualty. -- of Coniston pass. onto the top of their last hill. much worse than I ever imagined. decision was made to call it a day. caving in the Brecon Beacons. will go to Sport Relief. home to thousands of children. And, sadly, there is another reason. clinic to have their babies. lost her own child Ellie. do postnatal care on the mothers. scenario for women and babies. helps to keep the centre running. staff would serve 60 or so children? get through 60 patients on my own. Are you seeing a difference? training, for health care workers. You need a few more Helens. you, that is it, I am satisfied. what Jane did and lose a baby. donate what you can, thank you. mums' visit to Kenya tomorrow. His memoir Unmasked is out now. Matt Baker and Michelle Ackerley are joined by one of Britain's most successful composers, Lord Andrew Lloyd Webber, who explains why he has put songwriting on hold to finally pen his memoir, after more than 50 years in showbusiness.